Go to the S-Button menu and select Administration > User Accounts. User Management dialogue box appears. Click on Esign tab. Select users (by checking their respective rows) and click the button Issue Certificate. 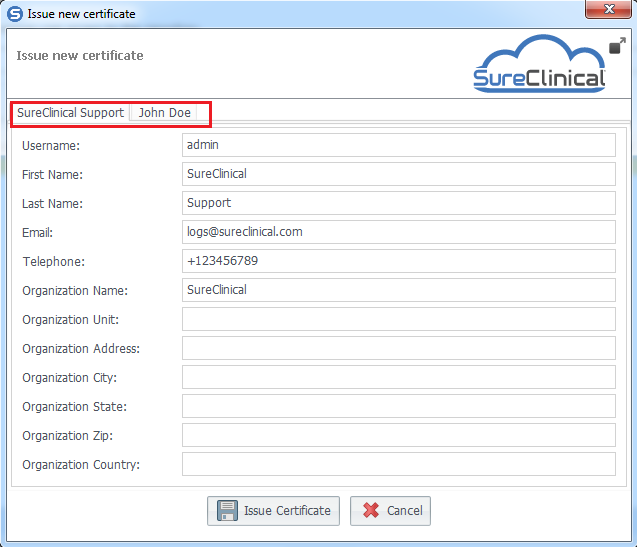 The Issue new certificate dialogue box pops up where you need to fill the details for every selected user (each user is added in a separate tab as highlighted in the figure below) and click Issue Certificate to complete the issue process. Each user is issued the certificate type displayed in his row for the Cert Type column. Thus, before you issue certificates, review values in this column and make sure that you issue the required certificate type (Standard or High-Trust) for each user.